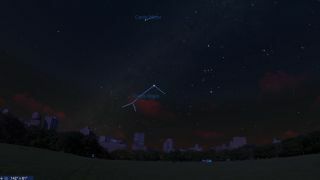 Canis Major and Canis Minor in the New York night sky on March 29, 2019 at 8:30 p.m. EDT. In last week's column about Leo, the Lion, we ended by mentioning several other nearby star patterns that were also members of the cat family. So this week, we'll give equal time to the dogs currently romping around our early evening springtime sky. There are two pairs of hunting dogs. One pair belongs to Orion, the Hunter, which at nightfall is visible tilting down in the southwest part of the sky. The other pair belongs to Boötes, the Herdsman, now making his way up from above the east-northeast horizon. Here's how to find them, and why they're worth a look. Canis Major, the Big Dog, is by far the most conspicuous of our four celestial canines. It is noteworthy because it contains the brightest star in the night sky: Sirius, the Dog Star. If you stretch an imaginary line from Orion's three-star belt to the southeast (or lower left) you'll come to Sirius — as if you needed Orion's belt to find it in the first place! This week, just look about one-third up from the south-southwest horizon at dusk and you'll see Sirius gleaming brightly through the twilight sky. Sirius is a dazzling object; it's a brilliant white with a definite blue tinge, and it owes its brilliance chiefly to its rather close proximity to us, just 8.6 light-years (or 50.6 trillion miles) away. It's 25 times more luminous than our sun and roughly twice as massive and twice as large. It's the fifth nearest star known, yet it's 550,000 times more distant than the sun. Among all the naked-eye stars, it's the nearest of all, with the sole exception of Alpha Centauri. On most star charts and atlases that show the old allegorical star pictures, Sirius marks the tip of the Big Dog's nose, though I prefer H.A. Rey's concept in his classic star guide "The Stars — A New Way to See Them" (Houghton Mifflin Co., Boston) by depicting Sirius as a dog tag. The rest of the dog is composed of a distinctive triangle marking the hindquarters and a long body. The muzzle and paws are uplifted as though Sirius were prancing across the sky following Orion. But Sirius on its own was known and worshiped long before the other, neighboring stars were added to make up the shape of the entire animal. In ancient Egypt, Sirius' first appearance through dawn's light was taken to be the sign of a special event and served to foretell and fix a most important date. For a long time, on the morning when it first became visible above the east-southeast horizon just before sunrise, it also preceded the rising of the Nile and warned the Egyptians when that important time was at hand. This first appearance of Sirius was thus used to herald the Nile flood at least as early as 3000 B.C. For this reason, Sirius became known as "The Nile Star" or "The Star of Isis." In stark contrast to Canis Major, the Little Dog known as Canis Minor is composed of only two naked-eye stars. But one of them happens to be the eighth brightest in the sky, a beautiful whitish-yellow twinkler that can be found by running a line through the two stars marking Orion's shoulders (Bellatrix and Betelgeuse) straight east (left). Like Sirius, Procyon is a close stellar neighbor at a distance of 11.5 light-years away. The name Procyon is the equivalent of the Latin word "Antecanis" or "Before the Dog" ("Pro" equals before and "cyon" equals dog), alluding to the fact that from the mid-northern latitudes Procyon rises about 25 minutes before Sirius, and thus heralds the appearance of the Great Dog Star. Yet when they are at their highest in the south, Procyon trots behind its more dazzling companion. In deference to Sirius, Procyon is sometimes referred to as the "Little Dog Star." Interestingly, both Dog Stars keep strange company, for each have dim, mysterious white-dwarf stars orbiting them. The one circling Sirius is popularly known as "The Pup." Both stars are about as massive as the sun, yet measure only a fraction as large. The result are stars that are packed together with densities approaching 100,000 times that of the sun. If we could somehow transport a teaspoon of this material to Earth, it would weigh something on the order of a couple of tons! Like the Little Dog, Canes Venatici (the Hunting Dogs) are also comprised of two naked-eye stars that are tucked below the handle of the Big Dipper. This star pattern is the creation of Johannes Hevelius (1611-1687), a Polish astronomer who created 10 different constellations, of which seven are still in existence today. Conceived just before Hevelius' death, Canes Venatici represent the Hunting Dogs, Asterion and Chara, held on a leash by Boötes. While Boötes is generally known as the Herdsman, he is also recognized as the "Bear driver," for he is also hunting the northern skies chasing the celestial bears, Ursa Major and Ursa Minor. The brighter of the two stars that make up this constellation is third magnitude Cor Caroli, which means "The Heart of Charles" and is believed to have been named by Edmond Halley (of comet fame) after his patron, King Charles II of England. Cor Caroli represents the dog Chara, while the companion dog, Asterion, is marked by the fainter star, Beta. Cor Caroli is a lovely double star in small to moderate-size telescopes. Canes Venatici's other claim to fame is that it includes two noteworthy deep-sky objects: Messier 3, a beautiful globular cluster, and Messier 51, the Whirlpool Galaxy, which along with its companion NGC 5195 form one of the best-known images in astronomy. I've often said that because both Canis Minor and Canes Venatici each have only two stars, that maybe we should call them "Hot Dogs" instead. Domestic dogs and wolves are related; they're both part of a large family classified as Canidae. For that reason, I should point out that we also have a wolf in our night sky, although the beast is not well seen from midnorthern latitudes since when it is at its highest it barely skims above the southern horizon, and at this time of year it's not visible until the wee hours (2 to 4 a.m.). This is Lupus, a small constellation, seemingly entangled with Centaurus, the Centaur, who appears as nothing more than a shapeless jumble of moderately bright stars. Charles Federer, who in 1941 founded Sky & Telescope magazine, perhaps said it best: "You don't really know all of the constellations until you have mastered the Wolf!"